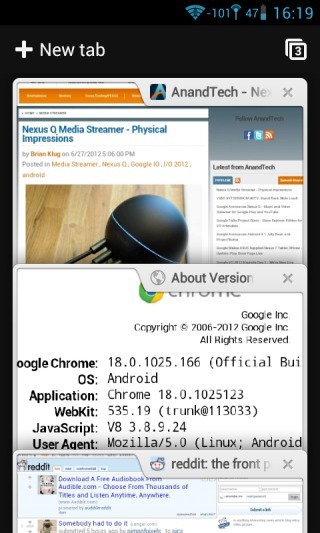 "Chrome for Android is the default browser in Android Jelly Bean and all the Nexus devices will include it. Chrome replaces the old 'Browser' app"
This isn't necessarily true for all we know. I have the dev preview of JB that the Galaxy Nexus handed out at I/O came with, and it does not come with Chrome as the default, in fact, Chrome isn't even installed. They did announce that it'll be the stock browser for the Nexus 7, but for the rest of the Nexus line, we don't know yet, unless you have a newer source than I do. Did they include flash support now ? And it still doesn't support extensions. Yeah, out of beta without extension or bookmarklet support. Useless for me without lastpass. Awesome. I have been waiting for this so long!